Necessity is the mother of invention, that has never been a secret. We know there can be inconveniences at the point of using PS4 controller on PC. That’s why we created reWASD. Our software combines lots of necessary features making reWASD the best way to use PS4 controller on PC. 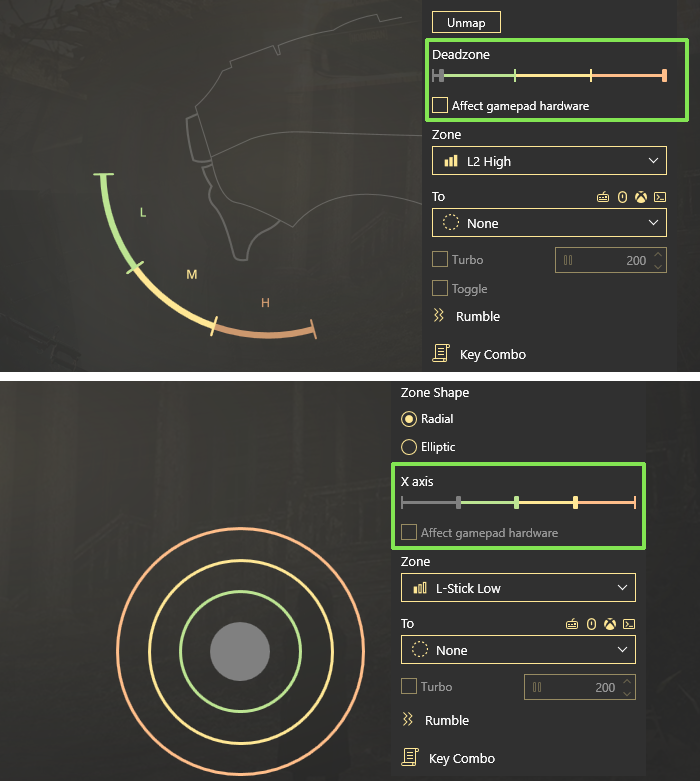 It’s super convenient to have all the tools in one app: both the tools to create the preset from keyboard keys (virtual mapping) and to tune the gamepad behavior (hardware mapping). Let’s see how to calibrate PS4 controller on PC with reWASD! Note: if you’re looking for a ready-to-go layout, and wonder how to connect PS4 controller to PC and use it for a certain game, you can visit reWASD community, where people share their configs. You’ll find plenty of game presets there, and all you need to do is simply download the file and import it to reWASD. If native controller layout is completely fine you can tune only the gamepad behavior: change stick response, set the deadzones for analog controls, turn off controller buttons, and many more. 4 dots are at your disposal, let your imagination flow! By the way, you can also invert stick axes (both X and Y) in one click. If the sticks or triggers are too sensitive. Is your controller and old pal that served you for years? Then you’ve already faced the rickety controls problem. Just make the deadzone bigger to avoid unwanted actions! How to connect PS4 controller to PC and use it for games without the gamepad support? Try reWASD mapping! Struggling with a game that doesn’t have controller support? reWASD mapping is the key to a perfect gameplay. You can map keyboard keys to controller and play the game with gamepad, like if it initially supports controller. What if you need precise mouse movements on digital buttons? reWASD saves the day! You can set the sensitivity, speed, acceleration and scroll speed, thus, make the perfect setting for emulated mouse in a certain game. You can use PS4 controller on PC and get the most of it if you use some unique features that we offer. Let’s talk about analog sticks! reWASD differs three stick zones: Low, Medium and High, and this feature permits to add mappings to them. Thus, when your stick moves to a certain zone, added mapping will reproduce together with the stick mapping. Thus, you set the range where W, A, S and D reproduce exclusively. If you need to maximize the accuracy, this will work as well, just maximize the Vertical and Horizontal axis range to avoid the diagonal movements. As a result, there will be less transitional movements, which makes the great setup for PS4 controller on PC in games where precision is necessary (for example, platformer or fighting games). The best way to use PS4 controller on PC is to make it as handy as possible. Good gamepad settings make good gameplay, so don’t underestimate the haptic feedback. This feature is mostly used for the “participation effect”, like you’re actually shooting and get a blowback. Hope this post will help you find out how to connect PS4 controller to PC and use it with any game. If you have some questions don’t hesitate to ask us in comments below, through our Facebook page or support directly. And don't forget to follow our Pinterest page for more news!